Land Rover Colorado Springs currently has one 2017 Land Rover Range Rover Turbocharged Diesel in our inventory! 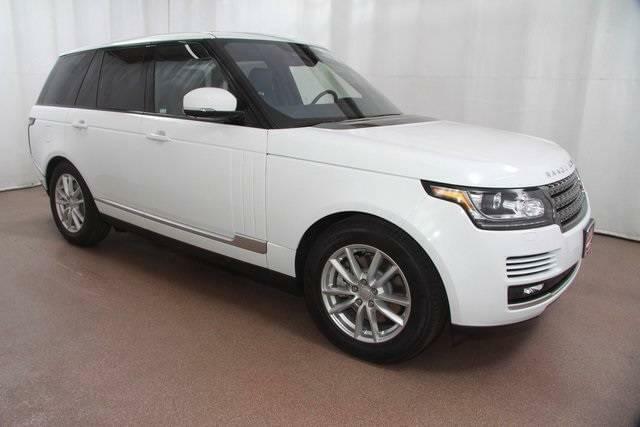 This Range Rover is a stylish addition to your family. With its comfortable seating for five, spacious cargo room, estimated 22 MPG city/28 MPG highway, and trailering capabilities, you can’t go wrong. The 3.0L turbocharged Diesel engine gives this SUV impressive power without sacrificing fantastic fuel efficiency! This luxury SUV does not short you on amazing features either. Heated front seats, integrated navigation with voice activation, InControl Secure Tracker System are some of the super feature on this vehicle. It also features heated side mirrors, real-time traffic display, forward collision warning, low tire pressure monitoring, trailer sway control, and many more. Stop into Land Rover Colorado Springs today to learn more about this amazing SUV. Let us show you the great selection of features and take a test drive. We are sure you will see how amazingly well the 2017 Land Rover Range Rover Turbocharged Diesel mixes luxury, innovative technology, and off-road capability.